Wallpaper adds an artistic feeling to an otherwise plain painted wall. It has come a long way since the days of tiny floral prints. Striped wallpaper fits within a wide range of interior styles that range from traditional to modern. Wallpaper can become a point of inspiration for an entire room, or it can complement an already established color scheme. Bring samples to your home before selecting your wallpaper to make it easier to visualize it in place. Apply wallpaper to all of the walls in a room or to just one wall as an accent.1. Style and PlacementStriped wallpaper can be bold or understated depending upon the colors and widths of the pattern. For a modern approach, position the wallpaper horizontally to visually expand the width of the walls. Vertical stripes offer a more traditional approach, but can be coordinated with a variety of styles. Tone-on-tone striped wallpaper is less prominent. For example, a white stripe alternated with a shimmery silver one can be very subtle. A striped pattern with highly contrasting tones such as black and white has a more dramatic effect in your room.2. Coordinating with StripesA primary concern of adding striped wallpaper to a room involves how to coordinate it with other elements in the room. Rooms with very little pattern in them to begin with might benefit by adding striped wallpaper. Color-coordinate striped wallpaper with other patterns such as florals or other stripes. For balanced contrast, consider a wide stripe when there are other small patterns in the room. Use a narrow stripe in a room with a large-scale pattern elsewhere, such as on a rug or on fabric. With multiple patterns, consider applying wallpaper with a color pulled from the room on just one accent wall for a subtle finishing touch. For instance, use yellow and white-striped wallpaper in a room that has floral curtains with yellow as the dominant color.3.Balancing Textures with StripesStripes act as a strong visual texture for a room. Solid painted or metal furniture acts as a counterpoint to the wall pattern. Reflective pieces such as mirrors or mirrored furniture duplicate the pattern in the room. Furniture or fabric that has a similar tone to one of the wallpaper colors blends and unifies the space. Stripes offer a strong backdrop for bold, solid colored fabric such as wool or leather.If you want to learn more,please email HANMERO at info@hanmero.com with your questions,we will try our best to help you! New Arrival– HANMERO Special Waterproof Wallpaper For Bathroom With Unique Technology. 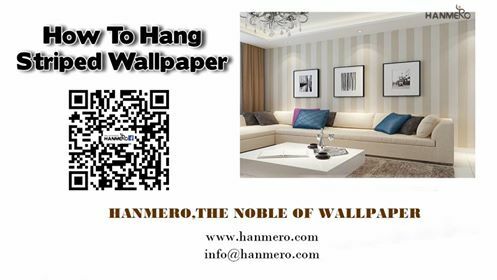 HANMERO：TOP 10 REASONS YOU SHOULD USE THE NEW HANMERO NON WOVEN WALLPAPERS.